08/12/2016 – Update v7.9 Color Picker, Pickup Assist, and Sound Improvements! 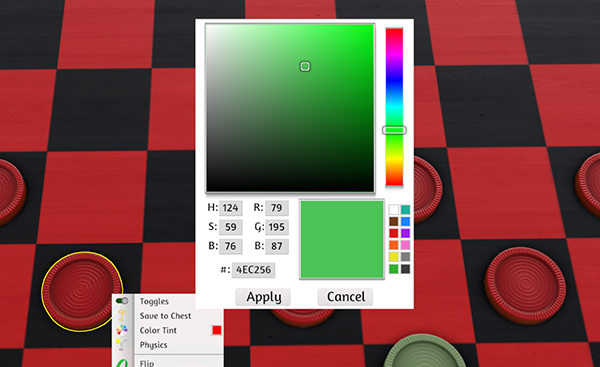 This update brings you a brand new Color Picker! We promised an improvement to the Color Picker in the past and now it’s here and better than ever! You can now choose the exact values you want to use for your objects without ever wondering if the color matches or not. We also have improvements to the Pickup Assist, making it easier to pick up objects. Also, we have improved Impact sounds – giving your ears much love! Improved color picker to be more advanced. You can change the RGB, Hex Code & HBS options. Default colors are listed for your convenience. This has been updated in the Contextual Menu Color Tint, Vector paint, Text Tool & Custom Object Specular color. This makes it easier to pick up objects giving a slight leeway on how close your mouse must be. Objects will no longer accidentally be picked up when an object is not highlighted. This will now scale based on the distance between the pointer and camera. The object will now be highlighted if it will pick up with assist to avoid accidental pickup. This has the same precision of the previous method, but now with an assist. Reformatted the /help on both the Global and Game tabs to be easier to read. Added /resetallsaved to the Global Chat command, so it can be used on both tabs. Removed high pitch doppler sound effects. Reduced overall amount of sounds that can occur at the same time. Overall, the sound should be much nicer on the ears. Improved accuracy of camera movement code so it isn’t slightly off. When loading saves, it will let you know of any saved cameras the game has. Made it impossible to resize chat window to be blocked by the top bar or go beyond the game itself. Improved table flip so that the table doesn’t get stuck on flipped objects. Fixed the text in the helper tooltip for Teams. Fixed collision issues with the Three Cheers For Master DLC. Fixed issue with being able to instantly pull item from stack or deck if you grabbed it slightly away from the object. Fixed issue with sliding cards to bottom of decks not smoothly moving into the deck. Fixed issue with Lift height and Rotation degrees randomly changing. Fixed issue with the specular color messing up if reimporting in the custom model material menu. Fixed collision clipping issue when using right click to pickup more than one object. Fixed issue with not being able to remove more than one person from your Blocked list. Fixed issue with Nudge not working on cardboard objects.